Finding a perfect tent for a family camping trip can be a daunting job. You want the product which has enough room to fit everyone you’re willing to camp with. 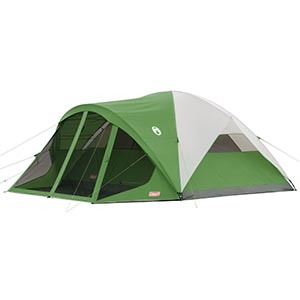 Coleman is a reputable brand which is known for its high quality and unique camping products offering you the best for your needs. Coleman Evanston Screened Tent is the right choice for those who look for something extraordinary in order to enjoy camping trip with multiple people. It comes with two different models one of which accommodates six people whereas another one is perfect for eight adults. In this Coleman Evanston Screened Tent Review, we will discuss why it is a good choice of a tent to buy. So let’s begin. The Coleman Evanston Screened Tent is made with a special focus on housing more people on a camping trip. It can accommodate 6 individuals without beds or 4 people with 2 queen size air-beds. This Screened shelter allows you to enjoy the wild and outdoor activities without even getting bitten up. Moreover, it allows you to fit 1-2 camp chairs contentedly in the porch area. People with 5.5 in height can easily stand up and move around.In 2017 it’s one of the best Coleman Tents so far. Usually, big family sized camps are hard to find in the budget. Even though, Coleman Evanston Screened Tent can house 6 people, it’s recommended to use it for 4 people if you want to enjoy a comfortable camping experience. However, this will fit the people as the brand claims but for comfort seekers, it’s wise to go with fewer individuals. You can use it for day trips and even spend 1-2 nights outside. Also, it offers a great backyard fun for kids, and comes handy in introducing them to the wonder of camping in an enclosed safe environment like your backyard. Coleman Evanston Screened Tent comes with numerous basic and special features and specifications. For example, it has welded floors and strong rain fly seams that stop rain water and other wetness from getting inside the camp. Like other product of Coleman, the Evanston Screened Tent also has a WeatherTec System that is designed to help you beat weather conditions in addition to enjoy camping with total fun and comfort. Moreover, its pole attachments ensure that the rainfly or other parts of the tent don’t fly away in strong windy condition. Moreover, Coleman Evanston Screened Tent has a safe electrical port that allows you to get the power in the camp. Other features include rainfly, awnings, large-sized windows, mesh roof, continuous pole sleeves and snag-free system. The Coleman Evanston Screened Tent comes with an easy 15-minute set up; and is a perfect camping option for both experienced and inexperienced campers. It has a comfortable, safe and spacious camping environment allowing you to spend daytime and even hours of darkness inside. It’s the best choice for those who are looking for their own overnight adventure. Coleman Evanston Screened Tent has a limited time warranty that usually lasts for one year only. The tent includes a “keep dry” spray for doubling up on the efforts during rainy season. While this is a waterproof product, this spray isn’t very effective in stopping some remaining drops going through the system in a very hard rain. Its screened porch doesn’t use the WeatherTec system therefore this area is subject to get wet. While some of the other products we have reviewed before were not as good as you want them for the weather conditions which are hard, this one will definitely stand so you can consider buying it.